Mike McCone passed away a few months ago, a friend of mine whom I first met in 1966. At the time, I was a Peace Corps volunteer in Sarawak, a state of Malaysia that is located in western Borneo. The nation of Malaysia was only a few years old, having been formed from the former British colonies of Sarawak, Sabah, Singapore and the Malaya peninsula. The Peace Corps was there to help the new government put together a primary school system in rural Sarawak villages where, previously, there had been no schools at all. My assignment was to find and train teachers for the upriver Iban tribal peoples and their new schools. I also trained those teachers and regularly delivered school supplies to them, upriver from the village of Betong. It was hot all the time. I sweat terribly. The monsoons came and went. The situation was the most rural I have ever encountered, the rain forests upriver as thick and green as you can imagine. I traveled by boat to get to the upriver schools, and often by foot as well if I had to get from one school to the next by means other than river travel. I was always isolated when traveling. No one spoke English. This was duty for which you had to volunteer because of that isolation. I had a few American friends, other volunteers working in Betong. But when I was upriver, which was most of the time, I was alone. Except for the Ibans, of course, who often found me to be a figure of comedy because I was so white and so large by comparison to them. They also assumed I was British. So I was able to take advantage of the fact that the Ibans liked the English, whom they felt had protected them during colonial times from what they resented as government over-reach on the part of the Malay-Muslim authorities. They also complained about Chinese over-reach on the part of every merchant they had ever met. The Ibans always paid me great respect, although I was just in my early twenties, and was certain that I did not deserve that respect. Mike McCone was in charge of the Peace Corps effort in Sarawak at the time. He and his then-wife Nini were islands of conversational comfort for me during my occasional visits to the capital Kuching and when they would come to Betong to visit me and the other volunteers. But for the most part, I remained alone. I had learned enough of the Iban language to get along well. They liked me, and I liked them. I was up and down the river on a regular basis. But, after a little more than a year and half, I went way off-kilter. I was suddenly awake one night. It was, as usual, excessively warm and humid, and I was sleeping on a cotton mat on the floor of my house in Betong, protected by mosquito netting. There were so many mosquitos (all the time, and especially when the river was high and overflowing its banks) that the very noise they made interrupted sleep. There were millions of them. Suddenly awake, I imagined killing myself by jumping out the window. This was foolish, because the window was only about ten feet above the ground. But it was the desire for immediate death that had taken hold of me, and I was more terrified than I had ever been in my life. I got up, put on some clothes, and walked as quickly as I could to the house of a fellow Peace Corps friend who lived on the other side of the village. When I got there, I heard recorded rock ‘n roll coming from inside the house. It was The Beatles. I raised a hand to pound on the door, seized by the need for help. But then I imagined my compatriot answering the door, and my attacking him as though to kill him. I held back, and retreated to the pathway before his house. I never saw that fellow again. I suffered through the night, seated beneath my mosquito netting and talking myself out of suicide. I had only enough money the next morning to get on the local bus that would take me to the major town of Simanggang, two or three hours away. I had to get to Kuching and Mike, for help. The entire way to Simanggang, I was approached by Ibans wanting to talk to the young Englishman. Throughout that journey, I imagined taking the parang knife (a de rigueur tool for any Iban walking through the woods or traveling cross-country) from the particular Iban who so wanted to speak with me, and attacking him with it. His friends would then attack me, I imagined, and kill me, a consummation to be wished. Here too, I was able to keep myself contained, although at quite difficult cost to my emotional paralysis. Finally, the bus arrived in Simanggang, at the central market. I was out of money, and had no idea how I could possibly get to Kuching. But literally as I stepped from the bus, I spotted Mike and Nini McCone, who were visiting Peace Corps volunteers in that town. My mind was racing with continuing electric images of self-destruction. I was entirely beset by terror. Mike saw this right away, and he took me to a Chinese tea shop in the market. (Nini apparently realized the gravity of the situation, and left me and Mike alone to sort it out.) Over tea, I told him what was happening. Years later, he told me that he was extremely alarmed, enough to realize that I had to get to the American medical team in Kuching immediately. He shoved money into my hands and escorted me to the Chinese taxi station next to the market. At the time, the road to Kuching was gravel the entire way, and there were only four taxis in all of Simanggang. I protested that I could take the bus. But Mike pushed me into the car, still talking with me, still counseling me. He told the driver, who spoke some English, that he was to take me directly to Peace Corps headquarters in Kuching. I later found out that Mike then went to the government offices in Simanggang (where, he knew, they had a British radio telephone, there being no regular phone system in Sarawak at that time) and, shouting down the clerk who didn’t want to let him use the phone, he demanded to speak with the district officer. Mike then phoned the head Peace Corps physician and told him about my difficulties. Still bedeviled by images of self-wounding, I got to Kuching and safety. Ultimately, I was flown back to the U.S., and Mike accompanied me on the flight. We’ve been friends ever since. On those occasions when I thanked him for what he did, he always said that he was only doing what anyone would have done under similar circumstances. Maybe so, but I was lost, and I believe to this day that Mike saved my life. Terence Clarke is the director of publishing at Astor & Lenox. His new story collection is titled New York. This piece was first published in HuffPost. I fingered the dial of my battery-fueled short-wave radio, to try to get rid of the recurring smatterings of static. In a shack on stilts, up from the coast of the South China Sea, on the Skrang River in Sarawak, Borneo in 1966, I had little to choose from for western entertainment. But Hanoi Hannah played the best rock ‘n roll of any station I could reach, so I listened to her as often as I could. Atmospheric conditions often intruded. Heavy monsoon rain against the tin roof of my shack rendered the music sometimes un-hearable. I grew tired of Hannah’s lectures about impending American military disaster, or her lists of names of crew members of arriving U.S. military ships to Vietnamese harbors. They were like long sermons or longer laundry lists, and very boring, offered in a monochromatic drone. The music, though, made listening to her wonderful. I understood that American troops in Vietnam listened to her as well, admiring the music, but laughing at the commentary. As exhortations go, I suspect hers were unsuccessful. But I heard my first Jefferson Airplane recording on Hannah’s show, a band that was part of an extraordinary flowering of new rock ‘n roll in the U.S. I was missing the whole thing, a volunteer with the Peace Corps in a Sarawak government rubber plantation for tribal Sea Dayak refugees who had been displaced by a war being fought between Malaysia and Indonesia. Hannah even knew that the Jefferson Airplane were from San Francisco, thus making me wish to be there, to see them live. But the short wave was my only real connection to the States at the time, other than the letters that I exchanged with my parents and grandparents, which my mother saved and I still have. I knew a few people who had gone to Vietnam in the military. But at the time they were still there, and I had no opportunity to speak with them about what was happening. The one time I had such an opportunity was in a bar in Kuala Lumpur on the Malayan peninsula. It was a rest and relaxation stop for U.S. Marines serving in Vietnam. I was in the place one night with Peace Corps friends, and everyone there except for the Chinese barmen, the women (all of whom were Asians), and us three white boys, was a black Marine. At first we were treated with complete indifference. I suspect that, at first, that was because we were white, and obviously out of place. But once I had been asked by one of the Marines who we were, interest in our presence heightened. “What is this Peace Corps s**t?” one of the Marines asked me. So I returned to my shack and turned on Hanoi Hannah again. The Marine was right. Hannah was a fan of white rock n’ roll. Mick Jagger, Janis Joplin, The Beach Boys, The Byrds, and all the others. Maybe there was an occasional Otis Redding or some such. But I don’t think so. I then understood the tiredness of those Marines, and their ultimate reluctance to carry on much of a conversation with us. That had something to do with being tired, for sure, but I suspect it had a lot more to do with deeply felt rage. For another look at Terence Clarke’s time in Sarawak, see “Borneo” in HuffPost. Clarke’s Sarawak novels, The Day Nothing Happened and The King of Rumah Nadai, originally published in the 1980s, will be republished in 2018. His new story collection, New York, comes out this month. In Webster’s, the definition of the phrase “to disrupt” is as follows: “to drastically alter or destroy the structure of something, as in ‘alcohol can disrupt the chromosomes of an unfertilized egg.’” Synonyms are words like these: distort, damage, buckle, and warp. It happens that one of the most important phrases used to describe current business innovation is this same “to disrupt.” Anyone who knows of the aggressive use of new business ideas to destroy the purveyors of competitive ideas, or more importantly to enable the ruinous takeovers of new inventive companies by others for the purpose of appropriating technologies that they themselves did not have the imagination to invent, will recognize the term “to disrupt.” It’s often a matter of what is called “corporate consolidation,” a bland-enough term, one would think. Harmless. Sensible. The disruption involved, though, comes about with a satisfied grumble of self-congratulation and triumph from those in senior management who have destroyed something else for their own benefit. But disruption does no one any good when it comes to the advancement of ideas and of the heart. All it does is destroy. Yes, you get to pump up your chest when you’ve gotten rid of available fresh thinking and imagination. But because there is little attention given to cooperative back and forth, the sharing of ideas, or the furtherance of the human soul, disruption is a rejection of that soul and a thumbing of the nose at it. This is also, of course, a distinctly male undertaking. And although the phrase “to disrupt” is the current business terminology of choice, it comes from a very traditional idea: the development of monopolies, trusts, and so on. Fascist governments and the like. We even now have a disruption of the entire weather system, thanks to industrial aggressiveness and wholesale disinterest on the part of certain current governments in a proven scientific truth. Disruption diminishes us. We are less human, less thoughtful, less innovative when it takes place because it serves the interest only of the disruptor. And these days, disruption seems to be a form of universal truth, accepted at most levels of business society. Opportunities for it are to be sought out and realized. So, your having succeeded in disrupting the competition is an accomplishment of great value, for which congratulation is in order. You are celebrated when you have destroyed them. You will be ushered into some hall of fame or other for having done that. You are the man of the hour, and perhaps one day you’ll run for president, and disrupt democracy. “Eddy, life’s too short, man.” Ernesto laid his glasses on the desk and rested the side of his head on his right palm, looking out the window. He took in a breath as Eddy nattered a reply. This was the second gig in a month that Ernesto had gotten for Eddy y Los Locos to which the band had arrived late. This time, Eddy explained, the Express Passenger broke down. The Express Passenger was an aging Chevrolet van, quite used, from Eddy’s cousin Lester Bedoya in Long Island City, which the band’s rising promise had allowed them to buy. They had removed all the seats in order to carry the band’s equipment, Eddy at the wheel. The other musicians, for whom there was no room in the van, would arrive by subway. The previous excuse, a month before, was that the Siena had broken down. The Siena was an even older Toyota vehicle that the band had named El Barco de Los Locos, also purchased from Lester. It too had no seats. At least on this second occasion, just the night before, the band had arrived, although an hour late. The first time, the band had not shown up at all, and Eddy had actually traded blows with the club owner the next day, on a Staten Island street corner, who had insulted him for being Puerto Rican. This time, the owner of the restaurant/bar in Brooklyn, a friend of Ernesto’s father from Argentina, shorted the band on its money because of their tardiness—“I had to do bird whistles, Eddy!”—and the other guys in the band escorted Eddy out of the place after the gig, so that he wouldn’t threaten the Argentine as well. The musicians in the band were terrific, Eddy himself a timbales player of real note even though he was only 19. But he had taken over the management of the band as well, from Joe Corteza, the pianist who had his head on straight, had two kids, no drug issues, and could organize the band well enough to get them to gigs on time. Eddy had recently fired Joe, jealous of the band’s dependence upon the older man’s more steady demeanor, and the fortunes of Eddy y Los Locos were now waning. During Eddy’s explanation, Ernesto surveyed West 23rd Street and the buildings across the way. His small talent-booking office was on the fourth floor of an old factory building now filled with art galleries, like almost all the buildings on this stretch of 23rd. It was now a very posh and self-important neighborhood. Comely, aggressively young, artfully dressed women walked around everywhere, a daily excitement for the 26 year-old Ernesto. The fashionable bohemian look of the many gallery visitors belied the clear poverty of the occasional artist seen sneaking around. The High Line was just a block away, and it symbolized for Ernesto the neighborhood’s change. Now The High Line was charming, safe and vernal, the talk of touristic Manhattan. He remembered it from his childhood as a heroin-beset disgrace, thirty feet up. Eddy’s rambling litany of excuses caused Ernesto’s mind to wander, and he had a sudden, affectionate recollection. As a small child 20 years ago, he had often visited this same building, which had a different purpose then. His father Cacho Goyeneche was the daytime shop foreman of a Post Office processing plant on the fourth floor. Little Ernesto loved the sound of the loose planking when he would walk across the shop floor on weekends, hand in hand with his father, when the machinery was silent. Cacho would have extra paperwork to do, and would bring Ernesto along for company. It was a sound that child and father both enjoyed, especially when Ernesto was challenged by his father to find the squeakiest floor plank of them all. There were thousands of thick planks, all of them many years old, most of them slivered along the edges, thick, warped and poorly painted. “Che chico, look around. You’ll find it.” His father would come out of the office now and then, to supervise the search. With so many loose planks, the quest was complicated and, for the boy, serious fun. Ernesto could never be sure which was the loosest. The day Ernesto finally found The Number One Plank, as Cacho called it, Cacho brought him back to the office, sat him down across the desk, and brought an envelope from a desk drawer. Ernesto tore it open and found a paper sticker with an illustration of The Virgin Mary on it, like the ones they gave out to the best students every Friday at Saint Edmund’s School in Queens, where Ernesto was in the first grade. The Virgin smiled, looking down dreamily from a swirling cloud. There were also two dollars in the envelope. Ernesto ran around the desk and hugged his father. He pocketed the two dollars and told Cacho that he would stick the sticker onto his bedroom mirror. Ernesto still had the mirror, in his own apartment. While The Virgin Mary was badly faded, and parts of the paper had fallen away at the edges, She still held a kind of floating, deteriorated court over Ernesto’s bedroom. During the week, millions of pieces of paper, envelopes, letters, personal packages, messages from home, messages to home, greeting cards, birthdays cards and every other sort of mailed item swirled, were processed and flew through all the Post Office machinery, Monday through Friday. They were eventually brought together in neat, paper-banded groupings that were then dumped into large canvas mailing bags. The noise in the shop made speech almost impossible. There was such a clattering metronomic racket everywhere that, of course, Ernesto could not actually hear the squeak of The Number One Plank when he visited during the week. But this was another order of thrilling excitement for the boy. Even in such chaos, his hand held tightly by his father so that he would not wander toward the dangerous machinery, he could feel the press of the loose plank against the bottom of his shoe and, so, knew that it was squeaking. The sound itself was a secret…knowable, the little boy thought, only to his father and himself. Ernesto had often thought since then that no memory could be so pedestrian, yet so deeply evocative of the feelings he had for his father. His father, whom he loved for the way he danced and, especially, the way he dressed when he danced—the perfectly ironed white dress-shirt, the jet-black silk necktie and just as black double-breasted suit, the black suede dance shoes with suede soles, his straight black hair laid flat against his skull with shiny Pomade—was Ernesto’s connection to his aunts, uncles and cousins back in Buenos Aires. He was the man who had begun Ernesto’s journey toward becoming a stellar asador, noted especially for his rosemary lamb, who gave Ernesto more than a dozen recipes for chimichurri, the best being the one that contained cilantro and therefore was “no chimichurri at all, hijo,” because no such vegetable was grown in all of Argentina. His father was the first to teach Ernesto to dance tango, showing him how to essay multiple agujas, amagues and boleos with rough, legible grace. Cacho was noted especially by the few actual professional tangueros in New York for his milonguero abilities. This rare accolade, in 1993 when the boy was 8 years old and attending his first summer milongas in a patio behind an apartment house in Queens, made Ernesto feel singularly honored as his father led him through the dance. Cacho…Ernesto’s father, who died in Buenos Aires while visiting a dying cousin, when Ernesto was nine. Recalling this, Ernesto felt his eyes turning to liquid. Eddy didn’t notice, and kept talking. The cousin was Roberto Goyeneche, and Ernesto’s father had at least been able to visit this cherished, famous relative—one of the greatest ever singers of Argentine tango—before Roberto died in 1994. Roberto was followed quickly by Cacho himself, who had a heart attack the day after the singer’s funeral. The last memory that Ernesto had of his father was that of laying his forehead against the side of Cacho’s closed coffin, returned to New York City from Buenos Aires. Ernesto’s mother Geraldín’s right hand patted the back of his head, caressing the boy. Cacho Goyeneche had often reminisced about his cousin Roberto—known as “Polaco” because of his pale skin and his skinniness—especially when he and Ernesto would listen to the recording Polaco made of the tango “Muchacho”, about a little boy who does not yet know the sadness of losing love, or what would come to him when he finally found love. “Children,” his father would say. “They know so little, Ernesto…especially about love.” When he learned that Cacho was dead, Ernesto knew that his father had been wrong about that. A few weeks after the news, Geraldín sat with Ernesto on the couch in their living room. She leaned far forward and pressed the palms of her hands against her eyes. She had an opened letter in her right hand. She lay it on her lap and read from it, a description by her sister-in-law of how Cacho had died. “We were dancing a tango, in Uncle Timo’s house, for the memory of Polaco. Cacho was always so good at tango. And fifteen minutes later he was gone, too. So alive in one moment…and the next, his soul suddenly vanished. ¡Ay Geraldín…!” His aunt had been unable to complete the sentence. Ernesto laid his head against his mother’s as she crumpled a corner of the letter. He wished to run from this duty. There should be no need for it. He wished his father alive, to take his wife into his arms, to dance. A priest eulogized Cacho in Saint Edmund’s parish church. Ernesto himself spoke at the funeral, but could not finish. Now, years later, still looking out his office window, still muttering imprecations at Eddy y Los Locos, Ernesto recalled a visit to their house by Polaco himself, on tour from Argentina, and a musician friend. This was the man who had written Cacho’s favorite song, an immortal tango about his own father’s death entitled “Adios Nonino”. The little boy, five years old at the time, was stunned by his father’s surprised, noisy amazement when the other musician came in the front door of the house behind the celebratory, much-welcomed Polaco. Cacho had to explain to the boy who Astor was, and when Polaco and Astor stayed for lunch—spaghetti al limón y crema, a salad of tomatoes, mozzarella cheese and sweet basil, salted, peppered and sprinkled with olive oil, and a great large loaf of Italian bread that they all broke up with their hands—Astor asked that the child sit next to him. He accepted a hunk of bread with a large clod of butter on it that Ernesto had constructed for him. Polaco and Astor both complimented Geraldín’s rustic cooking, especially the quality of freshness of her home-grown tomatoes, which, in Astor’s words, “leant music to this salad, señora.” Later in the afternoon, Cacho described that particular Saturday as the most important day in his life. “Except, of course, the day you were born, chico,” his father hurried to say to the un-offended, equally happy Ernesto. Once he was able to get Eddy off the phone, Ernesto sat silently as he recalled his father sitting in his office in the processing plant, on the following Monday afternoon, in a white shirt and tie, looking out the window onto the shop floor. Ernesto and Geraldín were visiting, having ridden into Manhattan on the E train. Ernesto, as always, was amazed by the rush of so many pieces of paper through so much cockeyed machinery. Because of the mystery of it, the boy had always cherished the question, and still did. 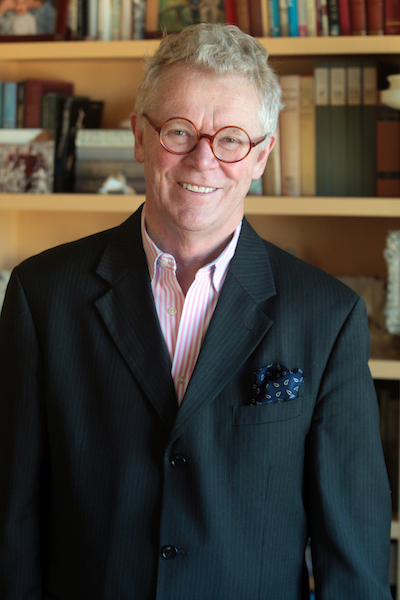 Terence Clarke’s new book, a story collection titled New York, will be published this year.